Is Common Core Developmentally Appropriate? The following is a comment I left on Diane Ravitch’s blog post, titled “Why The Common Core State Standards for Grades K-3 Are Wrong“. Thank you for breaking this down. The argument presented seems to be more concerned about the assessments that will be used to determine student achievement, and not necessarily the standards themselves. I believe there are two issues here, and they each need a more thorough analysis so these conversations do not devolve into punditry. There will always be standards. Look at Indiana. They are going to replace the Common Core with standards that are…very similar to the Common Core (Source: http://blog.heritage.org/2014/04/22/indiana-education-standards-common-core-trojan-horse/). What a colossal waste of energy, time and public dollars. What the CCSS got right was laying out what can be expected of learners at each grade level. We tested this out in our school by focusing on informational writing this year in all content areas. Each grade level built rubrics around that standard, and then provided lots of modeling, scaffolding, and practice for students to attain proficiency. What were the results? You be the judge: https://www.evernote.com/shard/s55/sh/51185e18-88dd-431d-8aed-638786566303/396f9c4174372f88b54f1fb20396e39a We had each grade level submit two or three pieces of exemplary work (anonymous), along with the students’ reflections. As students now walk the hallway, they can see what is expected of each learner K-5. Of course, not every student made the mark at mid-year. We get that and continue to help each learner meet their potential. So why not strive for excellence? When I hear “not developmentally appropriate”, I cringe, because I believe it is a slippery slope toward low expectations schoolwide. If the argument made here were more about the high stakes tests and how they are inappropriately aligned, administered, and misused, then I would agree 100%. 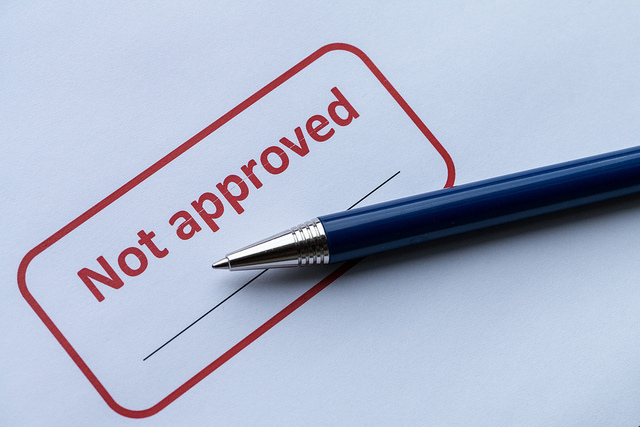 But to lump the CCSS with high stakes tests, or with one person’s decision to cancel a kindergarten play, does few in education any favors. Author Matt RenwickPosted on May 13, 2014 May 15, 2014 Categories Advocacy, Assessment, Leadership, Reflection, Soapbox, Teaching, WritingTags assessments, ccss, Common Core, Diane Ravitch, high stakes tests, writing1 Comment on Is Common Core Developmentally Appropriate? Read other administrators’ posts. Go to badgeradmins.wikispaces.com for a comprehensive list of recommended blogs. Emulate their style and structure when developing your own voice. Determine your purpose for blogging. Do you want to communicate with families? Reflect on your own practices? Connect with colleagues? All of the above? Think about what you want to say and/or jot down your ideas on paper first. Doing this prior to writing a post helps organize your thinking. Connect with educators on Twitter to build your professional learning network. You will want feedback on your posts. This social media tool is a great way to share your writing with others. Write, type, then blog. At least initially, write your post on a word processor and copy/paste your writing into your blog. Choose your tool. Determine which blog service you want to use. I prefer WordPress. Google Blogger is also popular. Focus on being a writer first, the writing second. This is a great tip from Regie Routman. What it means to me is, without being engaging, thoughtful and to the point, it doesn’t matter what I am saying because no one will want read it. The messenger is just as important as the message. Get your ideas down. Worry about conventions later. Save it before you publish. I reread and revise my posts many times before publishing. Barry Lane’s five steps for the writing process are revision, revision, revision, revision and revision. Share your post with someone you trust before sharing it with the world. You can be critical, but always be kind. Add lots of tags. These are the breadcrumbs that allow others online to find your great ideas. When you have ideas, get them down. Save your thoughts as a draft and come back to it later when ready. I have a draft I have been sitting on since August. It won’t be ready to publish until May. Put yourself in your writing. People respond to humor, questions you have and anecdotes. Share your posts out on Twitter and other social media tools. Thank those who retweet and recommend your posts to others. Reciprocate by reading and sharing their posts. Check out your statistics and allow comments. This is precious feedback to help you get better at writing. Don’t change older posts. I have come around on this. I used to think that as my thoughts changed after unlearning and relearning, I should also change what I have written. However, unless there are glaring grammatical errors or a poor choice of words, it is important to leave your previous thinking as is. Add a comment to your post to clear up confusion or address questions. There is nothing wrong with saying, “This is what I thought then, and now I think…”. Share your posts with your staff, colleagues and boss. Can you think of a better way of modeling writing and sharing yourself as a learner? Have fun. I hope I have not made blogging sound like you are writing a term paper. As Alan Levine states in his terrific post The Question Should Be: Why Are You NOT Blogging: “Blogging should be conversational. It is your own personal thinking, shared out loud”. Thank you to Jessica Johnson (@PrincipalJ) for sharing this. I would go into the rationale for why you should blog, except that Superintendent Christopher Smeaton already did this so well in his post Why Blog?. I know there are many more ideas and tips out there. Please share in the comments. I am fortunate to have inherited an elementary school last year that had a reading-writing initiative already started. This year we are taking the next step and setting new goals connected with the Common Core State Standards (CCSS). To help us in this process, we have started using professional learning communities. One of our collaborative groups that meet once a month are vertical teams focused on writing. A teacher from each grade level (K-5) plus specialists will come together, bringing student writing samples and rubrics aligned with CCSS. They will use this information to assess our learners, analyze data and make instructional decisions. Additionally, staff are using iPads to create two-way communication with parents, by housing student writing in Dropbox as an ePortfolio. How it will (hopefully) work: Each student will have their own file in Dropbox. This file can be shared with his or her parent(s) and other teachers by using their email addresses. Families and staff can then view the contents of that student’s file, make comments and even add more samples of that student’s writing. As the year progresses, teachers will periodically visit each student’s writing ePortfolio, both individually and with the student. As a team, they will decide what writing pieces best displays their learning as well as the student’s areas for more growth. When the school year is done, next year’s teacher can move their new students’ writing to their Dropbox files from the previous year’s teacher’s files. It is both exciting and scary when I think about the shift we are making to improve this part of our assessment system. Although portfolios have never been this accessible by parents and multiple staff members, the concept itself is nothing new. Richard Allington devotes a whole section of his book Schools That Work to this tool for measuring student learning. He describes multiple types of portfolios to use for different purposes. The type we are using are called progress portfolios. They show growth over time by housing pre- and post-assessments, periodic student surveys, interviews and reflections on goals, quick writes, several drafts of the same writing project, running records and retells. 1. Explain and educate (both teachers and parents). 2. Decide how to and when (with mobile technology, collect one piece of writing per student per month). 3. Demonstrate and decide (model using ePortfolios at staff meetings and parent nights; decide as a staff what standard(s) and genres we will focus on). 4. Establish the role of portfolios in grading (student information is being stored in a third party application, so grades will not be assigned). 5. Rethink the classroom environment (in the cloud; accessible from any Internet-enabled device). 6. Organize (block out time during the school day for students to conference with their teacher on their portfolio’s content). I can remember teaching not that long ago. Portfolio conferences would be coming up and, later than we should have, the students and I would throw together some semblance of a collection of their work. I generally refer to this dance as the “portfolio shuffle”. By conference time, the portfolios looked great, but they were just for show. Very little reflection and subsequent learning occured during the process. I know, I know, I should have been better about taking time during the year to have students reflect on their writing periodically. But I got busy. And I wasn’t working in a professional learning community, which would have helped me stay more on top of this assessment process. With that, the goal of this initiative, with regular collaboration, is to develop and sustain online student portfolios in order to see growth in student learning over time while it is happening. Today’s parents want to be more involved in their child’s development at school. It is well explained in Why Social Media Matters by Kitty Porterfield and Meg Carnes. Parents now have multiple devices in which they can access this information. The authors also point to research that shows prior education, background and income level of parents are not as prohibitive for families to connect online as one might assume. All the proof you need can be found in the parent waiting area in your school, just before dismissal. This change to ePortfolios is timely with emerging technologies. The apps pictured below are the tools we believe will help us achieve our goal. 1. Dropbox is the easiest application for both teachers and parents to use. The files in Dropbox more resemble what the teachers see in their shared drive through a district server. The leap from their computer files to Dropbox is a shorter one. 2. Dropbox can accept all types of files without altering their original format. Evernote and Google Drive can also do this, but there is some maneuvering involved to be sure they stay the same. 3. All three allow the teacher to share files with parents. Unfortunately Google doesn’t play well with Apple. Evernote is much better, but requires a lot more training to understand what a “tag”, “notebook” or “stack” is. 4. Both Google and Evernote have a “for Dummies” book written for it. Universal truth: If you have one of these books written about your product, it is not ridiculously easy to use. Dropbox is. The initial goal here is to better communicate student learning, not necessarily to learn a new technology. 5. Each student can have a file assigned to them in Dropbox, along with several files within it for the different months, again to show growth over time. Developed by physical education teacher Jarrod Robinson, this app provides an easy-to-use interface to document student work. This is not limited to photos or documents only. Links to blog posts, audio of a student retell and video of a group presentation can all be recorded and uploaded to Dropbox. There is a companion app by the same company called Easy Assessment. It allows the user to create rubrics and score students on their work. Because we are just starting ePortfolios, we won’t be using that tool at this time. These native apps are used to snap a picture or take a video of anything and save it on the device. Dropbox connects with your camera roll in Photos and can upload this information. That means a teacher can take a picture of every student’s writing and then save it in Dropbox for later reading. No more heavy bags filled with stacks of papers to take home. As well, students can now either take their writing home if completed right away, or post it on a community bulletin board. The teacher no longer has to run a copy of each piece so he or she can grade one and post the other. Whenever a teacher has a few minutes to score some papers, these apps allow the user to adjust the pictures (Snapseed) and write feedback plus a time stamp right on the photo of the student’s work (Skitch). Save it back to the camera roll and upload it again to Dropbox. Now that iOS 6 has arrived, Pages allows the user to upload documents to Dropbox. This update sealed the deal for me. Pages is so versatile in creating documents such as reports and newsletters. So how would a teacher use this to document student writing? At the primary level, the teacher could do some shared writing and save it in each student’s file. It can then serve as a strong example of what that type of writing should look like. For older students, they could email a Word document to their teacher, who can then open it in Pages and subsequently upload it to Dropbox. Speaking and listening are also a part of the CCSS. Even though Easy Portfolio has the capacity to take video of student conversations, iMovie has a lot more functionality to develop presentations. Both photos and video can be combined with text and audio to create movies that can be shared not only in Dropbox but also through YouTube and Vimeo. 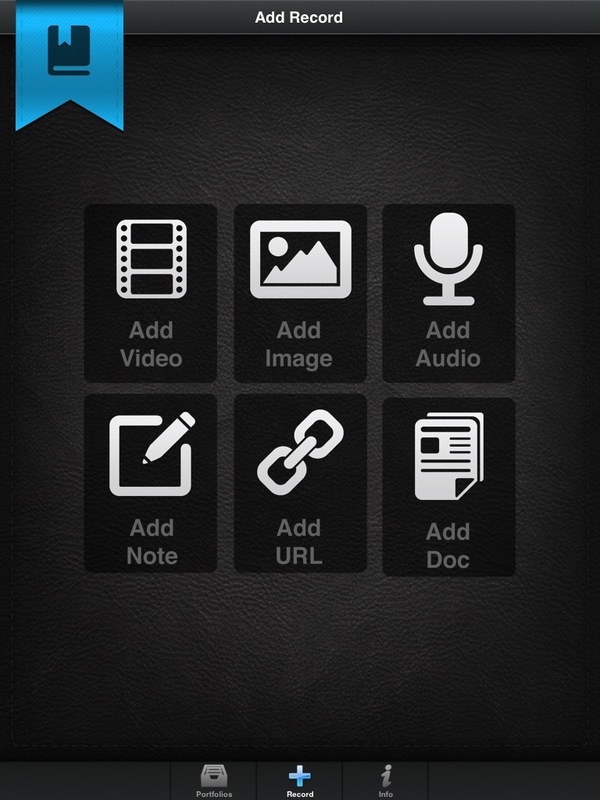 This may be the only app needed to assess students in their presentation skills. This dictation tool uses speech-to-text technology that allows students to say what they want to write and literally put it into words. Then a student can copy and paste their now written words into a word processing app such as Pages for revision and storage. Especially helpful for younger kids and students with disabilities. You can put students’ names and notes on separate cards and sort them based on specific academic skills you are working on with them. 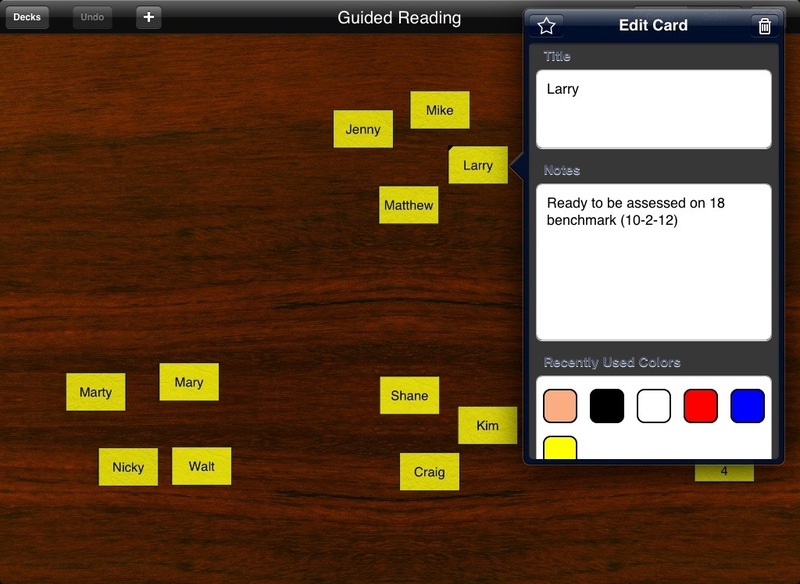 Guided reading and math groups can easily be organized and monitored. Although a set cannot be uploaded to Dropbox, a teacher could easily take a snapshot of the current group make-up (home + power) and save that photo in a separate file. 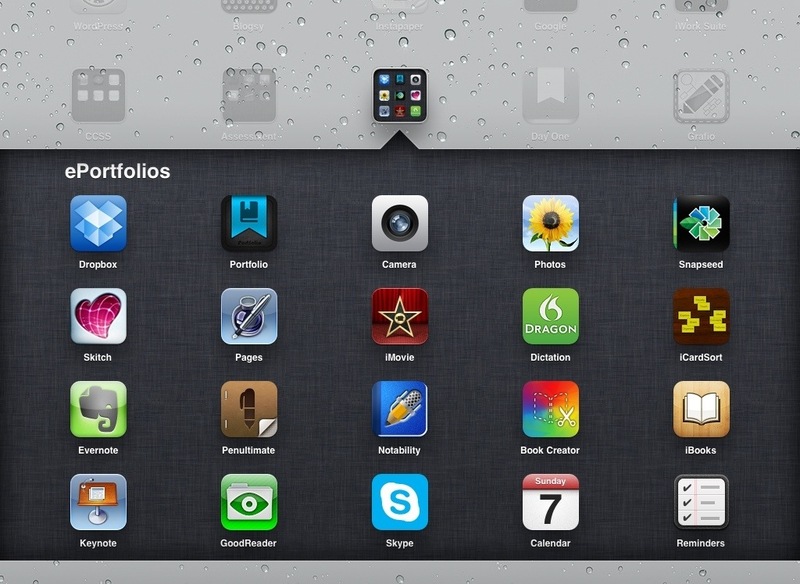 Evernote is widely used by other schools and districts for student ePortfolios. It seems to be utilized more often at the secondary level, although I know many elementary reading teachers use it successfully to take notes when conferring with a student. Penultimate is the handwriting app that works in concert with Evernote. Notability is another excellent tool for recording and documenting important student information. It is an app that talks with Dropbox. 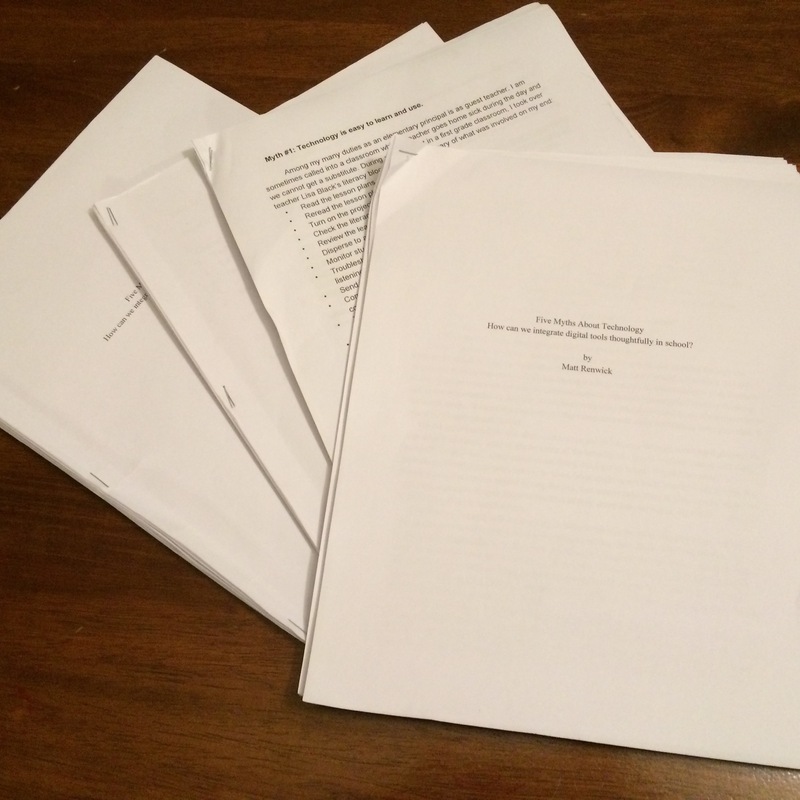 I recently wrote a post about all three applications for assessment. Book Creator allows students to do just as it states: Create their own books. Pictures, text and narration can all be incorporated to write original eBooks. It can be saved into iBooks with the sound still a part of the book, and stored in Dropbox as a PDF. Even if your classroom has only one device, a teacher could write a shared story or nonfiction text to show students the writing process. The CCSS asks students to analyze and respond to multiple texts from different sources and genre. Teachers can model this with Keynote and GoodReader. With Keynote, a teacher could create a slideshow displaying multiple examples of original student work on a singular topic. He or she could then think aloud the process of comparing and contrasting the writings and generating common themes and understandings found. This could be a very effective strategy at the primary level. For older students, GoodReader could serve the same purpose. Original documents related to the content areas such as history can be marked up, highlighted and annotated. GoodReader can also connect with Dropbox for uploading purposes. With the video conferencing capabilities of these applications, authors, scientists and other professionals can visit classrooms at a fraction of the cost of an in-person visit, many times free. If the chat is displayed on the interactive whiteboard (IWB) using mirroring technology such as Reflection, the discussion could be recorded and saved for later viewing and research. I throw these tools in because it is important to schedule assessment during the instructional day. Calendar can be synced with your online schedule, and Reminders serves as a “to-do” list with built-in alerts. In Leading School Change, Todd Whitaker wisely states, “I have spoken about leading change. However, I hope your efforts really involve leading improvement.” As the principal, I will continuously point out that we are learning together throughout the process. We have built in time to showcase our successes and celebrate small victories along the way. As well, we are not changing just because we want to present ourselves as 21st century educators. The concept of ePortfolios has the potential to allow us to better connect with our families, to more closely align our instruction and assessments, and to develop highly collaborative teams to improve student learning. The possibilities that this technology provides makes it an exciting time to be an educator. Allington, Richard and Patricia Cunningham. 2002. Schools That Work: Where All Children Read and Write. Boston: Allyn and Bacon. Calkins, Lucy, Mary Ehrenworth, and Christopher Lehman. 2012. Pathways to the Common Core. Portsmouth, NH: Heinemann. DeFina, Allan. 1992. Portfolio Assessment: Getting Started. New York: Scholastic. Porterfield, Kitty and Meg Carnes. 2012. Why Social Media Matters. Bloomington, IN: Solution Tree. Whitaker, Todd. 2010. Leading School Change. Larchmont, NY: Eye on Education.